I need to point out I played these games right after another and it was pretty amusing. Both games feature a female lead with a male companion who refers to the lead as "Red". It was a pretty weird coincidence. Cute though. Ah man, completed this game and it was quite a journey. For anyone unaware of this game, this is the fifth and final installment in the Blackwell series. 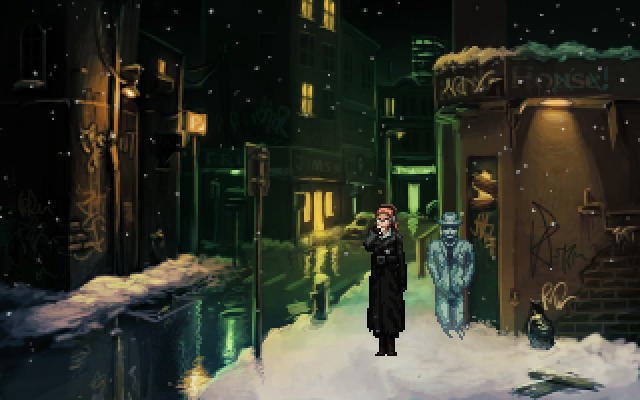 It's a 2D point-and-click adventure game where you play as a woman with a ghost as your companion. I don't want to reveal more of who and why simply because the story is one of the major things I loved about this series. The puzzles are usually simple and make sense most of the time. So like I said, Epiphany is the final game in the series and Dave Gilbert (the man behind this series) did an amazing job tying up loose ends that have been dangling since the first game. The story was amazing and full of twists and revelations. It's not only the most well written in the series but it also has the best voice acting in the series too. I really enjoyed all the new characters and locations. Long-time fans who played every game in the series will be satisfied with how this ends. This installment is also both visually and musically the best in the series as well. The animations have improved quite a bit and the music is great throughout. The voice cast was perfect as well. Gilbert did an amazing job directing them and choosing the best lines. I was very impressed with the VO. I also finished this game and it was a lot of fun. I really loved the world and characters. The art is absolutely amazing and pure eye candy. I wanted to take screenshots of every area and cutscene. Hell, even the UI is well designed. So beautiful. The music is also excellent and very haunting. It gave the world an ethereal feel. Simply scrumptious. The VO was also quite excellent for not just the Transistor but also a few other characters as well. Really good stuff. The combat was just loads of fun. The ability to fight in real-time AND semi-real-time was really cool. All the Functions that you can equip as secondary skills or passive abilities added a ton of flexibility to how you wanted to fight. It's really deep and complex and added a lot of replayability. Speaking of which, there's Recursion Mode for anyone who wants to replay through the game with tougher enemies. It's basically NG+ but also adds a few extra tidbits to the story that makes it well worth playing through at least once. I only played a bit of Recursion Mode but I can tell there were some alterations to the interactions already. Anyone who played Bastion's NG+ mode will probably know what I'm talking about. The story is pretty interesting but may be a bit hard to understand because of the way it's told. I found most of it pretty easy to figure out but there are questions that still lingered after I finished it. I'm not sure if Recursion Mode will answer them all but I'm happy with the way it was presented. It's like a puzzle and I think players will have a good time discussing about it. The ending was satisfying which made me glad. Supergiant Games has done it again. I loved Bastion but Transistor is definitely an improvement in both presentation and gameplay. The game is challenging, fun and is a visual/audio masterwork. I wonder what they'll do next? Anyway, I highly recommend it!